For the third consecutive year, Artist Dempsey Essick has been asked to originate a special painting for First Night Piedmont. Inspired by the overwhelming success of past First Night projects, Essick has created a masterpiece for First Night '95. "Country Elegance" is perhaps the most beautiful and visually arresting still life in his entire body of work. Essick has always been drawn to the feel and texture of old wood. For "Country Elegance" he went back to Carolyn Phillips' restored log cabin in Davidson County, North Carolina, which was the setting for his recent release, "Summer's Treat". He draped a hand crocheted dresser scarf over Carolyn's antique cupboard which was in the cabin, then he arranged a tobacco drying tray, a child's carry-box, and one of Joyce Tetter's hand woven baskets; on the top. For color and depth he randomly scattered a profusion of Daisies, Asters and Zinnias across the arrangement. The resultant picture, with its background which deepens from brown to almost black is reminiscent of the work of some of the nineteenth century realists. 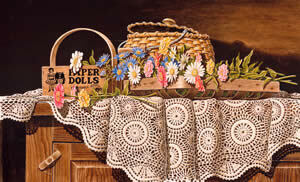 As the viewer examines the details of wood grain, basketry and flowers so real one can imagine the fragrance, the eye is drawn back time and again to the crocheted dresser scarf which is the central focus of the picture. The fine detail of Essick's brushwork depicts each fold, loop, knot and thread in an almost three dimensional rendering which seems to extend outward, beckoning the viewer to reach out and touch. Part of the fascination an art collector has for the work of a particular artist or group of artists is the mystery of how the mind and hand of a mortal man can master so simple a thing as paint and a brush and use it to create a beautiful picture that contains more realism than a photograph by virtue of the fact that it encompasses not only a moment in time, but the compilation of moments as stored in the mind of the artist. In "Country Elegance," Dempsey Essick has not only demonstrated the skill of a master painter but has allowed the viewer a look into his mind.